Quiet time to study before lunch at Tefft Middle School in Streamwood. The percentage of low-income students at Tefft nearly doubled over the last decade and is now at 75 percent. The school is “beating the odds” on the WBEZ/Daily Herald Poverty-Achievement Index, scoring higher than might be expected given the percent of low-income students in the school. In the rhetoric of the American Dream, an individual’s success is earned through hard work and determination. In the rhetoric of recent school reforms, a school’s success depends on quality teaching and high standards. Poverty shouldn’t matter when it comes to either. The reality of Illinois’ education system tells a different story. A new analysis of a decade of state test score data by WBEZ and the Daily Herald underlines the immense role poverty plays in how well a school performs. Our analysis shows a vast expansion of poverty—2,244 schools have seen their proportion of low-income students increase by at least 10 percentage points over the last decade. And the number of schools struggling with concentrated poverty—where nearly every child in the school is low-income— has ballooned. But perhaps most troubling, WBEZ and the Daily Herald find that poverty remains a frustratingly accurate predictor of how well schools will perform. Schools full of middle-class kids rarely perform below average on state tests; schools made up of low-income kids rarely score above. The graphs show that the greater the percentage of low-income students in a school, the lower the school&apos;s test scores tend to be. Click here to view an interactive version of the 2014 elementary scartterplot and here for the 2004 version. The diagonal black line is a trend line. R2 is the strength of the relationship between poverty and test scores. The graph also shows a dramatic increase in the percentage of low-income students in the state, and more schools where nearly all kids are poor. Each dot represents one school. All Illinois elementary schools with test scores are plotted. The effect of poverty on school performance is well known. But a graph of 10 years of state test score data paints a picture of near-perfect stratification. Schools with the fewest poor students score the highest on average. Schools’ scores go consistently down from there as the proportion of low-income students in a school goes up. The pattern holds for every income level over every year for the past decade — for both elementary and high schools. The line chart shows the percent of students meeting or exceeding standards on Illinois’ high school exam in 2014, for various income ranges. The blue line at the top of the graph represents the average performance of more affluent schools — where low-income students make up between 0 and 12.4 of enrollment. The green line at the bottom of the graph represents the average performance of the poorest schools — where between 87.5 and 100 percent of students are low-income. For many, including state officials, the pattern is disturbing, even un-American. How poverty impacts schools — and how well schools educate low-income children — are vital questions for the state. For the first time, in 2014, more than half of Illinois public school kids — 51.5 percent — were considered low-income, up from 39 percent a decade ago. And across the country, the gap between how well poor and wealthy students perform on standardized tests has grown wider in the past 50 years. “The impact of poverty has to be included in our conversation,” says new state schools superintendent Tony Smith in response to the WBEZ/Daily Herald analysis. Smith was appointed by Gov. Bruce Rauner in April. “[Poverty] is a big deal, it needs to be paid attention to,” says Smith, who also says government policies helped create and structure poverty over the past century, and that government policies are needed to ensure equal educational opportunity. In contrast to what many might think, all the growth in low-income students in the last decade has come outside the city of Chicago — which actually saw its population of poor students decrease by 29,000 over the last decade. In 2004, more than 45 percent of the state’s low-income public school students attended Chicago public schools. Today, that figure is 32 percent— and falling. Meanwhile, on average, Illinois school districts have seen a 15 percentage point increase in the proportion of their student body that’s considered low-income. 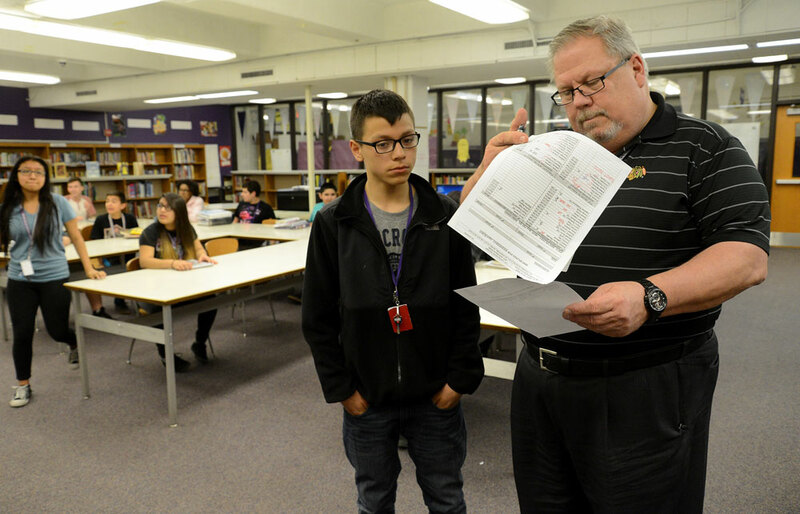 In Elgin Area Unit District U-46, the sheer number of low-income students in the district has nearly doubled over the last 10 years. The district now enrolls 24,003 low-income students, more than any district outside of Chicago. Plainfield SD 202, the state’s fourth largest school district, educates 10 times more low-income students than it did a decade ago. It ranks 16th in the state in terms of the number of poor students it enrolls; a decade ago, the district did not even rank within the top 100. 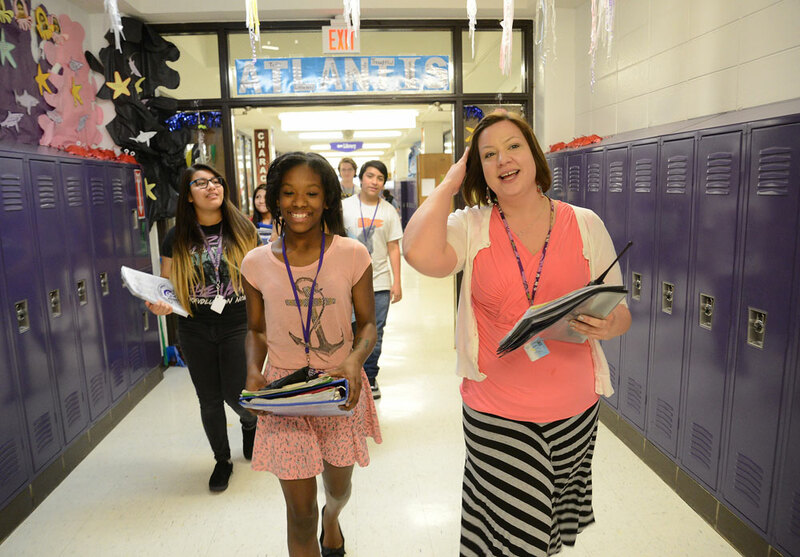 Indian Prairie CUSD 204 — with schools in Naperville, Aurora and Bolingbrook, including vaunted high schools like Neuqua Valley — has followed a similar trajectory. That district in 2004 enrolled just 780 low-income kids out of 26,147 students total. Low-income students accounted for just 3 percent of its student body. 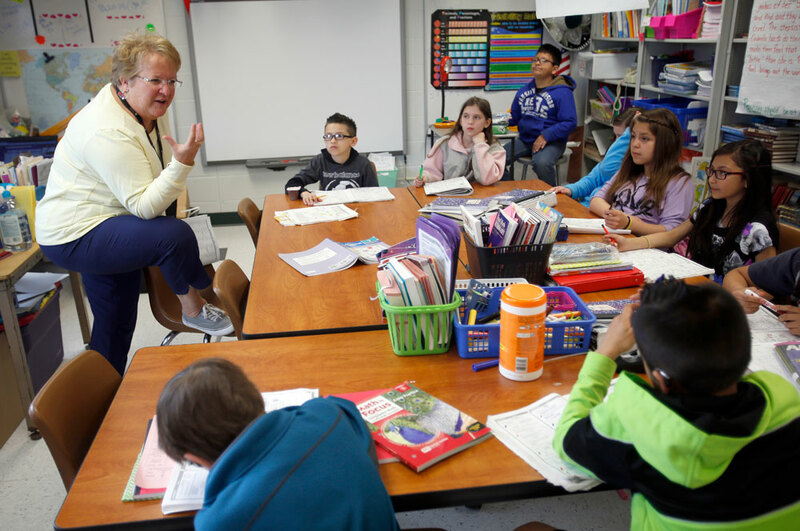 Today District 204 enrolls 5,088 low-income kids, 18 percent of all students. The district ranks 20th in the state for the number of low-income students it serves. Jason Klein, chief information officer at Wheeling District 21, says when he started as a teacher at London Middle School in 1998 the low-income rate was below 15 percent, but the school considered that high poverty. The shifting demographics have been a struggle for suburban districts that historically were not used to dealing with large populations of low-income students. Klein says it can take some time for school districts to catch up with the changes. “There&apos;s often a lag between when a school or district&apos;s demographics change and when the staff and community realizes that it&apos;s changed,” he says. A growing number of Illinois schools are also dealing with concentrated poverty — where nearly every student is considered low-income. The number of schools where more than 90 percent of children are low-income has swelled, from 421 schools in 2004 to 649 in 2014. Today, 17 percent of all public school students in Illinois attend schools where 90-100 percent of students are low-income. American society is more residentially segregated by income than it was in the past, says Greg Duncan, professor of economics and education at University of California-Irvine, and that is contributing to growing achievement gaps between rich and poor students. Compared to a generation ago, “low-income kids are more likely to have low-income neighbors, high-income kids high-income neighbors,” says Duncan. What that means for schools is “quite troubling,” he says. Researchers and advocates for poor students say there are lots of reasons why poverty impacts achievement in school. Joseph says poverty also takes an emotional toll that impacts academics. Unstable employment and financial insecurity increase family stress. That can adversely affect the quality of parenting and family relationships, and put stress on children who would otherwise be focusing their energy on learning, Joseph says. Schools don’t cause achievement gaps, researchers say. Gaps between poor and non-poor students are present even before kids get to school. Even getting to school can be a challenge for low-income kids, from difficulty affording transportation to not having a safe passage to walk to school, says Elaine Allensworth, director of the Consortium on Chicago School Research at the Urban Education Institute at the University of Chicago. Many see school funding in Illinois as a glaring issue exacerbating poverty’s impact on learning and schools. “Achievement gaps are a direct result of gaps in opportunity to learn,” said Natasha Ushomirsky of the Education Trust, whose mission is to eliminate gaps for poor and minority students. “The highest poverty districts in Illinois get nearly 20 percent less in state and local funding per child than the lowest poverty districts,” says Ushomirsky, citing a recent Education Trust study she authored that analyzed education funding across the country. That study, released this year, found Illinois has the widest funding gaps in the nation between low- and high-income schools. Ushomirsky’s group also advocates for school policies that don’t necessarily cost more — they support new Common Core standards, they want states to be more selective in determining who can become a teacher. They want schools to assign the best teachers to the neediest kids, and ensure that teachers truly believe all kids can learn. Michael Petrilli, of the conservative Thomas B. Fordham Institute, says money isn’t the fundamental problem. And he says taking a school’s poverty rate into account is important, but more important is the growth students make in a school. “If you&apos;re a school that has low test scores and is not helping kids make progress…those schools need to face significant reforms or they need to close.” Petrilli calls it the “tough love” approach to education reform. “If the school is too dysfunctional, at some point you have to give up on that school, shut it down and open up new schools to replace it with a vision and strategy to get the job done.” He laments that more Chicago charter schools haven’t opened in the suburbs, where poverty is spreading. Joseph points to expanded preschool programs, federal tax credits for working poor families, and food stamps as strategies that most help kids. He says daycare assistance programs—recently targeted for cuts by Gov. Bruce Rauner’s administration—are also vital in reducing poverty. Duncan, the UC-Irvine professor, says that with affluent parents now spending $10,000 per child per year on enrichment for their children—everything from music lessons to summer camps to private tutoring—the burden on schools to keep low-income kids learning at the same pace as upper-income kids “has increased very substantially.” He stresses that test scores have improved for all children since the 1970s — including poor children. But upper-income children’s scores have improved more, widening the gap. The Daily Herald continues this series on poverty and school achievement this week. WBEZ will be following the series on the Morning Shift. Linda Lutton is an education reporter at WBEZ. Melissa Silverberg is an education reporter at the Daily Herald. Tim Broderick is news presentation editor at the Daily Herald.